February 14, 2010 - The Boeing Company, industry teammates and the U.S. Missile Defense Agency on Thursday successfully demonstrated the speed, precision and breakthrough potential of directed-energy weapons when the Airborne Laser Testbed (ALTB) engaged and destroyed a boosting ballistic missile. This experiment marks the first time a laser weapon has engaged and destroyed an in-flight ballistic missile, and the first time that any system has accomplished it in the missile's boost phase of flight. ALTB has the highest-energy laser ever fired from an aircraft, and is the most powerful mobile laser device in the world. During the experiment, the aircraft, a modified Boeing 747-400F, took off from Edwards Air Force Base and focused its high-energy laser at the missile target during its boost phase as the aircraft flew over the Western Sea Range off the coast of California. MDA officially recognized directed energy's warfare-changing potential last March, when it awarded its Technology Pioneer Award to three Boeing Airborne Laser Testbed engineers and three of their government and industry teammates for advancing key ALTB technologies. Boeing is the prime contractor for the Airborne Laser Testbed, which is designed to provide unprecedented speed-of-light capability to intercept all classes of ballistic missiles in their boost phase of flight. Northrop Grumman designed and built ALTB's high-energy laser, and Lockheed Martin developed the beam control/fire control system. Boeing provided the aircraft, the battle management system and overall systems integration and testing. The Lockheed Martin developed the Beam Control/Fire Control system focused and directed the beam generated by the Northrop Grumman-developed megawatt-class High Energy Laser, and the Battle Management System developed by Boeing, Airborne Laser Testbed prime contractor, managed the engagement. ?Shooting down a threat-representative ballistic missile target is the latest in a remarkable series of firsts that the government and industry team has achieved in demonstrating this leading-edge technology,? said Doug Graham, advanced programs vice president, Lockheed Martin Space Systems Company. ?This successful experiment validates the effectiveness of this revolutionary technology and makes it the most mature directed energy system in the world, opening the door to further new possibilities for the application of this technology.? ?The Beam Control/Fire Control System has performed with outstanding results in the most demanding mission to date,? said Mark Johnson, Airborne Laser Testbed program director, Lockheed Martin Space Systems Company. ?The Beam Control/Fire Control System, which consists of a sophisticated suite of optics, low-energy lasers and software, has been rigorously tested in more than 140 flights since 2004, making technology history all along the way as a result the close partnership and dedication of the government and industry team.? The Beam Control/Fire Control System tracks the target, determines range to the target, compensates for atmospheric turbulence and focuses and directs the High Energy Laser beam. Lower-energy lasers ? the Track Illuminator Laser and the Beacon Illuminator Laser ? determine where to point and focus the High Energy Laser. 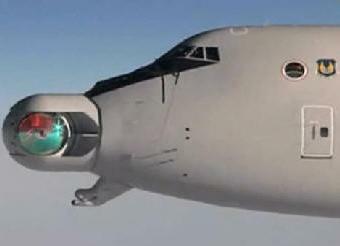 The High Energy Laser beam passes through an optical path before exiting through the conformal window on the nose of the aircraft on its way to the target. The Missile Defense Agency manages the Airborne Laser Testbed (formerly known as the Airborne Laser (ABL)), which is executed by the U.S. Air Force from Kirtland Air Force Base, Albuquerque, N.M. The Boeing Company (NYSE: BA) provides the modified aircraft and the Battle Management System and is the overall systems integrator. Boeing?s Airborne Laser Testbed industry partners are Northrop Grumman (NYSE: NOC), which supplies the High Energy Laser and the Beacon Illuminator Laser, and Lockheed Martin Space Systems Company, Sunnyvale, Calif., which provides the Beam Control/Fire Control System.